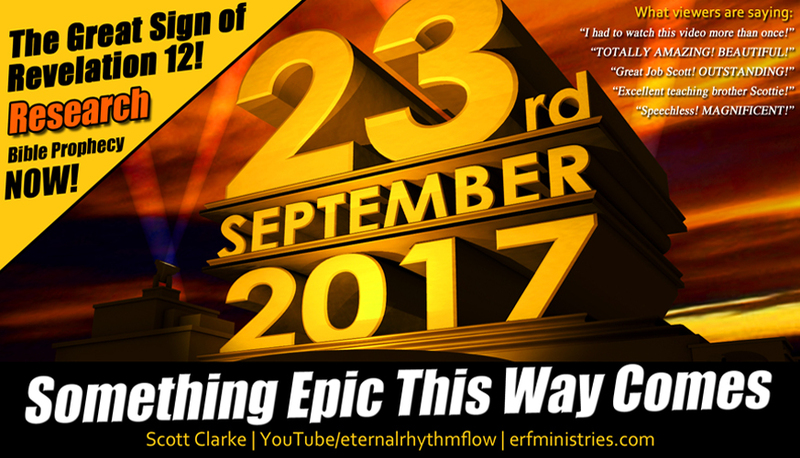 Will the Rapture Occur on Sept. 23rd 2017? Many are speculating based upon prophetic texts from the book of Revelation that September 23rd of this year, which coincides with the Hebrew Feast of Trumpets, that the New Testament "rapture" could take place. I have heard no one promise it, but it is being alluded too, and no doubt thousands are watching and wondering. 5 And she brought forth a man child, who was to rule all nations with a rod of iron: and her child was caught up unto God, and to his throne." If you just take a moment to type into any search engine the words, "September 23rd" and "rapture" and you will see Christian and secular news on the subject. It's has now officially become "a thing". To be clear, I am a skeptic. A very large skeptic in fact. However, the hypothesis out there right now does have problems. I am forced to be brief in writing this post today, so let me just conclude with this. I do not believe that the Revelation 12 "theory" if you will, that is going around the internet proves that the rapture will take place on the 23rd (at the time of this writing, it will be the 23rd in a few minutes in Jerusalem). "And there shall be signs in the sun, and in the moon, and in the stars; and upon the earth distress of nations, with perplexity; the sea and the waves roaring"
It isn't lost on me that on Aug. 21st of this year we had a solar eclipse, and that very well could and perhaps should have us, the Body of Christ, paying attention of what follows because Genesis 1:14 says, "And God said, Let there be lights in the firmament of the heaven to divide the day from the night; and let them be for signs, and for seasons, and for days, and years" (emphasis added). And since just that SIGN, we have seen a lot of other signs in powerful demonstrative ways, certainly here in the U.S. and abroad. I won't bother to name them, you already know. God is shaking and stirring this world, and trying to get man's attention. And the shaking and stirring will increase, until He has their attention.